An award-winning travel magazine, National Geographic Traveller (UK) is one of the most iconic brands in the world, known for its stellar journalism, epic storytelling and authentic travel experiences. It features some of the world’s best photography and places the reader on location, right in the heart of the action. 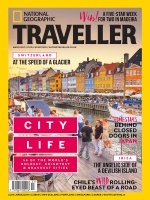 With ten issues a year presented in an insightful, reader-friendly way, National Geographic Traveller Magazine helps people to explore well-known and hidden locations around the globe and travel safely in all of them. A National Geographic Traveller subscription will inspire anyone with a passion for experiencing new cultures and landscapes while also championing sustainable travel and celebrating journeys from a local perspective. Order now and have each issue delivered to your door for free. Exclusive hideaways: From Brazil’s Iguazu Falls and Beijing’s Summer Palace to a remote Seychelles island – the ultimate rooms with a view… New Zealand – discover the award-winning produce of the South Island… Capri – wild cliffs, spectacular villas and Italian glamour… Thailand – seven ways to see the best of the Land of Smiles… A modern classic – Greece: a creative renaissance… The Silk Road – 47 days, 6 countries, 7,456 miles… Louisiana’s Bayous – tales from the swamp… Colombia: how to get your kicks in the coffee region… City life: 46 of the world’s boldest, brightest and brashest cities… Homestays – behind closed doors in Japan… Ibiza – the angelic side of a devilish island… Chile’s wild, rolling-eyed beast of a road… Switzerland at the speed of a glacier… China – it’s not all black and white in the land of the meat-eating panda… Order your National Geographic Traveller subscription today for more stunning travel articles every month and discover your sense of adventure. Who Reads National Geographic Traveller Magazine? Each issue is read by 150,000 people in the UK with a core audience of 35-64 year olds and slightly more women than men, all of whom love to travel.